While leaving early avoids a run-in with their superior, it also means that they don’t have time to eat, a decision which will affect how their day unfolds. 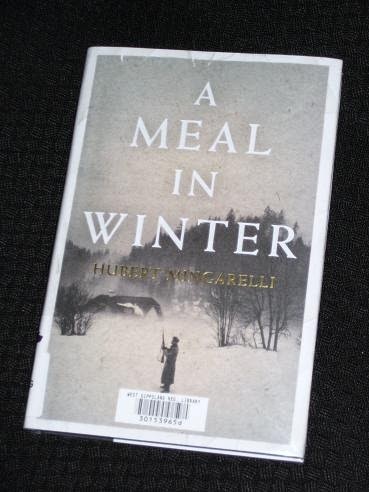 A Meal in Winter is a very short work, its 138 pages exaggerating its size; I actually finished this in well under an hour. It can barely be called a novella, more an extended short story, and in its focus on a very limited area and group of protagonists, it’s actually more akin to a play. The book is divided into short sections, and the language is fairly simple, more plain than elegant, but very effective. The writer is effectively basing a story on a moral dilemma, setting up a situation where the soldiers have to make a choice about what to do with the prisoner they wish they hadn’t found in the first place. Initially driven by a desire to justify their escape from the camp, the soldiers begin to regret their discovery once they have time to reflect on it in comfort. Did it deserve to make the longlist? Not sure really, unless there’s a secret clause 324 c (ii) in the IFFP regulations which states that a WW2-themed book must be on the shortlist every year. It’s a good book, worthy of the longlist, and it has grown on me since I finished it, but when you consider the books that were left off the shortlist (The Sorrow of Angels, Brief Loves that Live Forever, The Infatuations), you can’t help but wonder whether the Wehrmacht connection got it over the line. And if it takes out the whole thing, then I’m done with the IFFP. Seriously. Thank you for your very had work this year. I have been inspired to read a handful from the longlist and will continue long after the prize is awarded. On to next year's list! I wanted tos let you know I have really enjoyed your reviews on these marvellously interesting books. I am starting to develop an interest in translated books after reading you, Bellaza and Stu's blogs. I am interesting to see who wins this award. Like you. I'd place 'The Sorrow of Angels', 'The Infatuations' and 'Brief Loves…' ahead of the Mingarelli (which ended up just shy of my shortlist). I did find it quite powerful though, and I could see it working really effectively as a play. You make a very good point about how Mingarelli takes care to humanise the three soldiers and to bring out their different personalities. At first, I wondered where he was going with Emmerich's story, but it forms a rather poignant postscript.